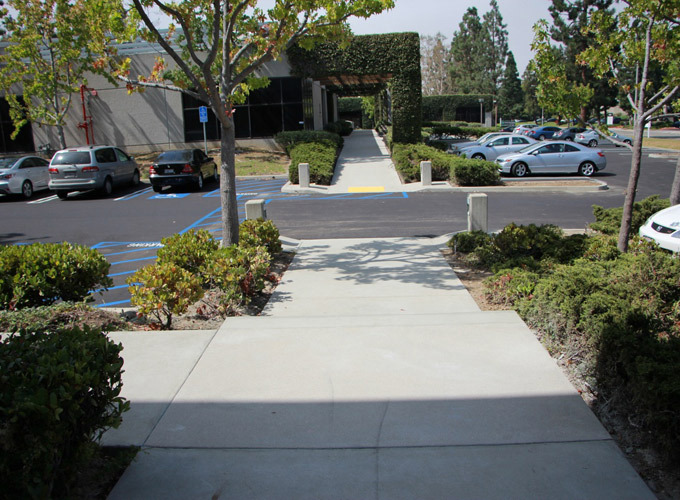 The project in Culver City took place at an existing business park and had to be divided into sections to allow pedestrian access to all occupied buildings within the business park. Our part in the completion of the project in terms of demolition includes: all saw-cutting, demolition and hauling of old pink colored concrete walkways, concrete ramps, concrete risers, stamped concrete building entries, root damaged planter curbs and the excavation of landscaping for new ADA compliant switch-back ramp. In regards to the construct portion of the project, our part in the completion of the project includes: new ADA compliant switch-back ramp with top-cast finish and poured in place concrete retaining walls, all ADA compliant concrete ramps, walkways and building entrance's with top-cast finish, all concrete risers with top-cast finish, new planter curb throughout complex and the installation of new ADA compliant handrails and truncated domes throughout the complex. Click on image for full project gallery. Osborne Place Apartments is a family housing apartment complex located in Pacoima, CA consisting of both the North and South Buildings. Our part in the completion of this project includes: on and off-site concrete curbs, rolled curb and gutter, all concrete mow strip, concrete perimeter bands at pavers, all concrete ADA accessibilities, temporary asphalt roadway for fire truck accessibility, concrete parking lot at South Building, bollards at South Building parking lot, supply and install 48"x48" modified frame and grate at South Building, all slab-on-grade concrete risers, concrete poured-in-place wall extensions, concrete walkways encompassing both the North and South Buildings, concrete gate track at automated front entry gate, bubbler catch basin at North Building, personal concrete backyard patios at North Building, personal concrete driveways at North Building, city drive approach, city curb and gutter, city asphalt slot patch and city under sidewalk culvert. 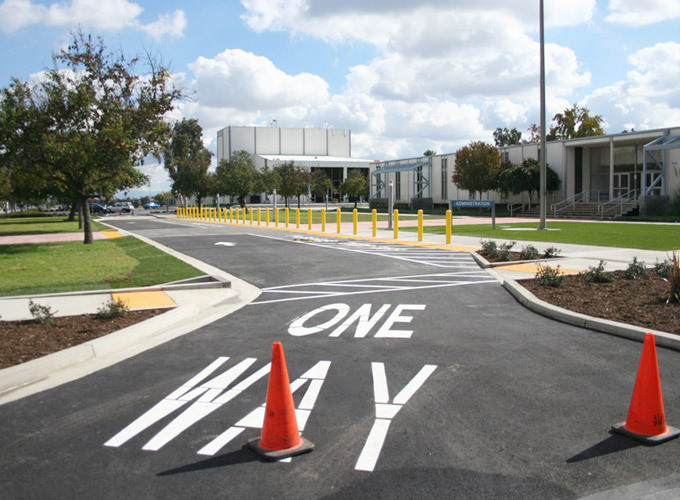 The Alondra Boulevard Drop-Off at Cerritos College helped alleviate excessive traffic flow by means of constructing a convenient new drop-off at the main parking lot on Alondra Boulevard. Our work completed at the site includes: on and off-site concrete curbs, curb and gutter, drive approaches, sidewalks, concrete v-gutters, under sidewalk culverts, concrete ADA accessibilities, installation of bollards, installation of truncated domes, architectural colored concrete paving with decorative saw-cut grids and masonry planter wall. The Villas at Gower is located in Hollywood, CA. and is an affordable housing project. Our part in the completion of this project includes: on and off-site concrete curbs, curb and gutter, drive approaches, sidewalks, under sidewalk culverts, concrete ADA accessibilities, architectural concrete topping slab with decorative saw-cut joints at courtyard, concrete cast-in-place walls, all slab on grade concrete risers, circular planter walls with monolithic cap at courtyard and front entrance. 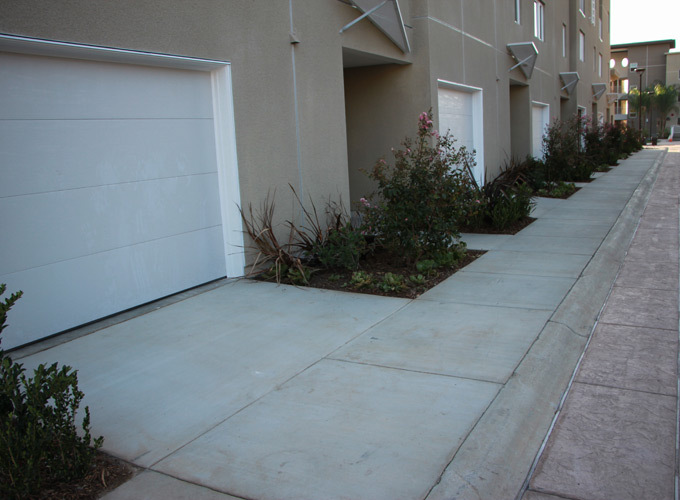 Harshfield Terrace is located in Palmdale, CA. 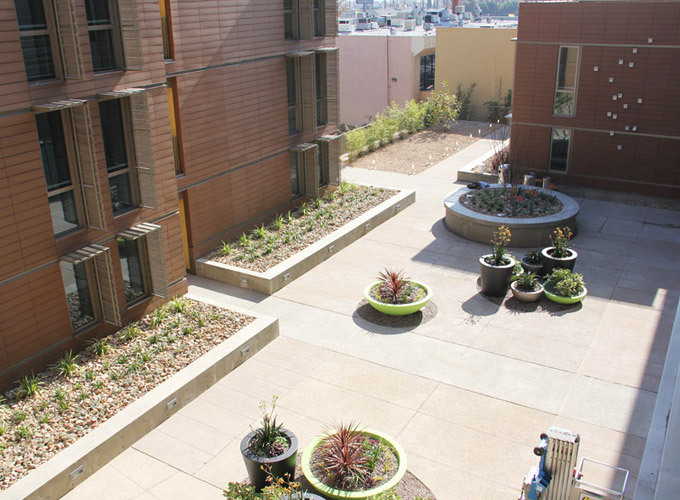 and is an affordable housing development dedicated to senior citizens. 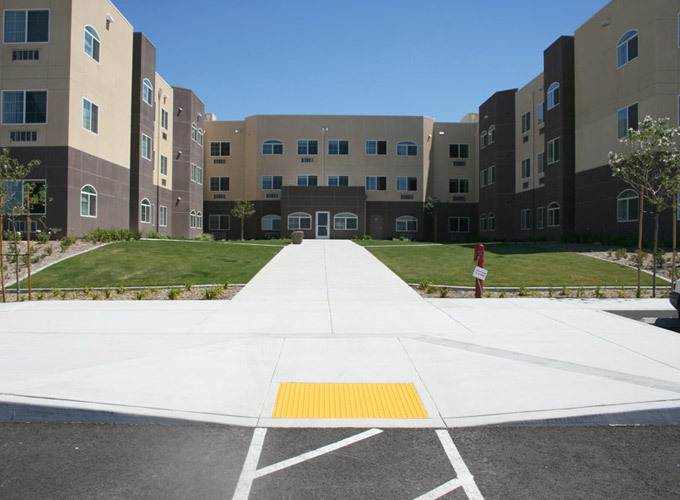 Our part in the completion of this project includes: on and off-site concrete curbs, curb and gutter, drive approaches, sidewalks, concrete v-gutters, trash enclosure pads, concrete ADA accessibilities, concrete light standard bases and concrete risers.